This hut was completed November 2013, replacing an old DOC hut. It is located on a terrace at the confluence of 2 branches of the South Opuha River beneath the Sherwood and Two Thumb Ranges. The former hut downstream, has been removed although the piles remain. South Opuha Hut (2013 one) • By Honora. Licence: C.
Most people fly in. A few hardy souls come over the Sherwood Range or the Two Thumb Range via Stoneleigh Saddle. We went in via Stoneleigh Farm track and up the S. Opuha. We elected to sidle on the true left as the river was up a bit. One other party has come via the river in the last 4 years, according to the hut book. 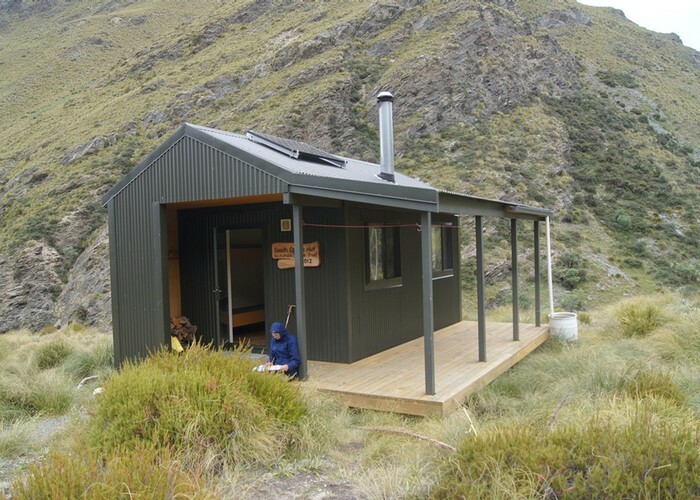 The hut is owned and operated by the Mackenzie Alpine Trust. It is free for the public to use. Added 25 February 2014 by MatthewMatthew. 4 revisions, most recently 18 February 2019 by MatthewMatthew.